Coolest Option Update Ever : Want your baby's name on the back? No problem. Want your baby's name on the back IN ELVISH?! No problem! Yes. It's that cool. Necklace cording is available, for those who wish to wear this around their neck while baby nurses or plays. You'll get 36" of adjustable, black, waxed cotton cording. Never leave baby unsupervised while using this option. This passage is written in Elvish. Which takes a while. But it's AWESOME! "AWESOME product - my cousin and her husband is going to LOVE this for their new miracle!" 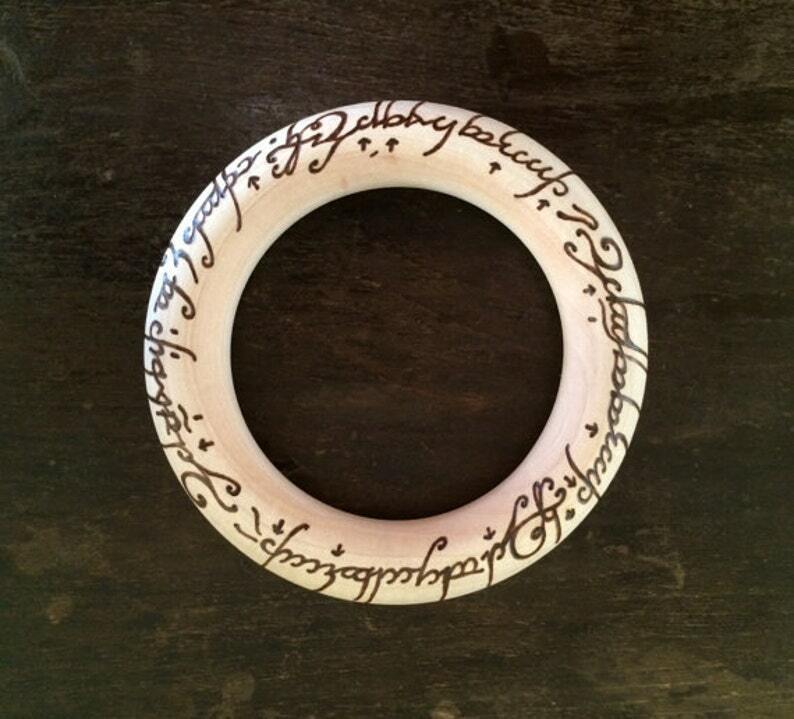 "Love this teething ring...was a perfect gift!" Words are woodburned by hand. 3" (diameter) Rings. > This item has been updated with USPS shipping prices. Beautiful teething ring, well made and darling! Great item! I look forward to giving it as a gift. Absolutely beautiful and exactly as described. Mama-to-be certainly loved receiving it.